Because of its effectiveness and gentle nature, the Activator Method has grown to become the world's most widely-used instrument chiropractic technique. 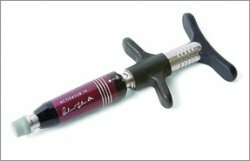 The Activator provides a controlled, fast thrust that is comfortable for the patient. In fact, adjustments with the Activator are so quick and measured, the body's muscles are less likely to resist, allowing for a more precise and accurate adjustment.Is the Activator Method right for you? Older patients, or those with arthritis, osteoporosis or other bone-weakening conditions find the Activator Method to be effective and gentle. The low-force thrust of the Activator Adjusting Instrument, and the doctor's ability to pin point the exact location of the problem through Activator analysis, can relieve a patient's pain without discomfort.